Glorious spring weather has finally arrived in the Central Pennsylvania region…what better time to enjoy the day and see what is sprouting, blooming and getting ready to bloom than an outing to the Gardens in Hershey. 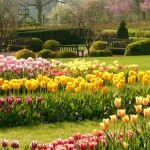 From Mid April through Mid May odds are you will be able to see some of the Gardens’ beautiful flowering bulbs, small flowering trees, cool season annuals and perennials. Look for tulips, primroses, redbuds, weeping cherries..nature isn’t always on our timetable so you never know what might be around the next bend. Be sure to check in at the various sections…the arboretum, the Japanese, Seasonal, Children’s, and Admissions Gardens all tend to have something of interest for all. And don’t forget…All Moms are admitted free on Mother’s Day!